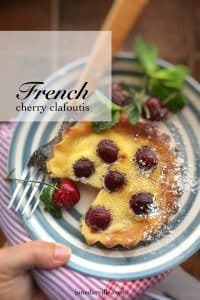 Cherry Clafoutis Recipe (French Dessert) | Simple. Tasty. Good. Time for a delicious French classic: my cherry clafoutis recipe! You can’t go wrong with this one. Look at the tiny amount of ingredients you need here. There’s absolutely no space nor opportunity to mess it up! The clafoutis batter should look like a runny flan or pancake batter. You can divide it over separate smaller tart tins or decide to make one large clafoutis tart and cut it into wedges afterwards. In that case I suggest to leave the clafoutis in the oven a little longer to make sure that the center has thoroughly set. Don’t worry: the edge of the clafoutis while baking can sometimes puff up a little. As soon as you take it out of the oven, it will kind of collapse again and sink. You don’t necessarily have to use cherries. Clafoutis can also be made with plums for example. Every now and then when I set foot in France I sometimes come across raspberry or apple clafoutis. Take a look at my grape clafoutis recipe and pear clafoutis with saffron as well! Cherry clafoutis tastes best when it comes freshly baked out of the oven. I wouldn’t recommend making it a day in advance. I tasted a leftover wedge of it the day after but it tasted a bit bland and rubbery. If you are using fresh cherries: remove any stems that are still attached. 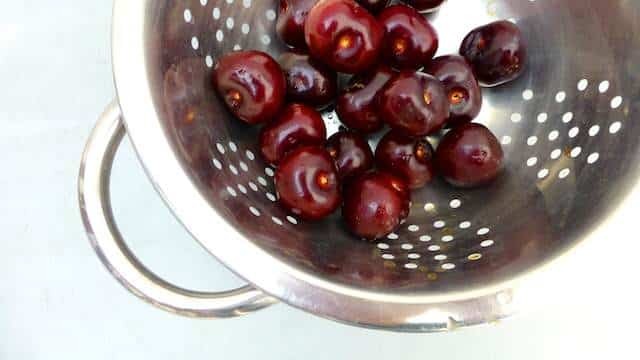 Then add the (fresh or canned) cherries to a colander and rinse them well. Let the cherries drain for now. 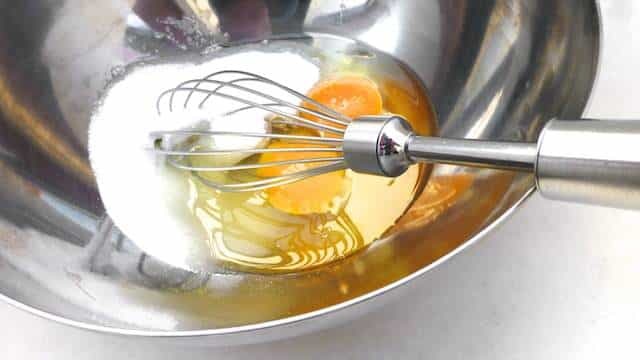 In the meantime in a large bowl beat the eggs and the caster sugar. Stir in the pastry flour. Stir well. 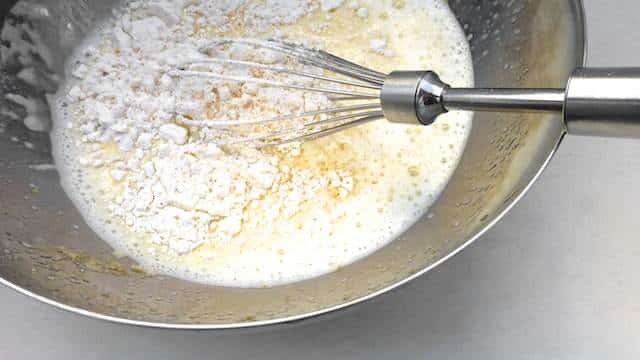 Add the lukewarm whole milk and a little pinch of salt. 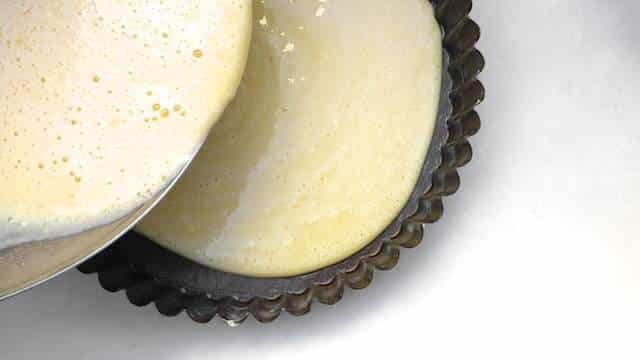 Beat all the ingredients into a silky batter. 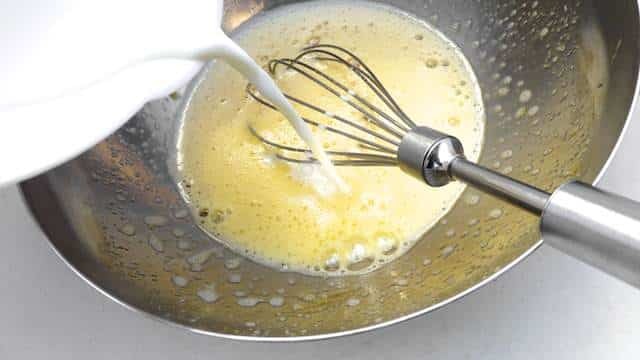 Pour this batter in a buttered tart tin. I used a tin that is 8-inch (20 cm) in diameter. 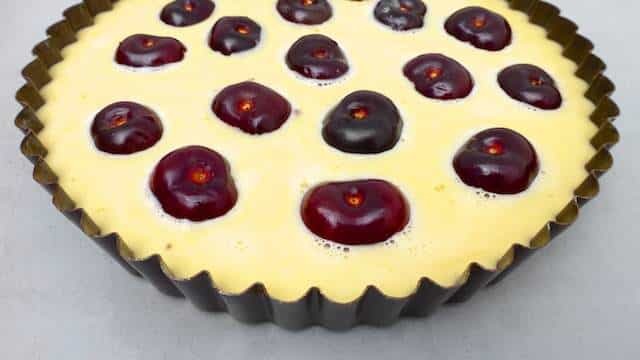 Sprinkle with the drained cherries. Bake the clafoutis for 45 minutes in a preheated oven at 356°F (180°C) until golden on top. Take the clafoutis out of the hot oven and let it cool down a little in its tart tin. Then carefully remove the lukewarm clafoutis and place it on a large plate. Sprinkle with some icing sugar and serve.